Traditional shirt check with short arm. Just right for the summer the traditional shirt of Orbis. Sporty medium-width check in apple green blue. Lightweight fine fabric made of 100% pure cotton. Shirt collar form with stag horn buttons. 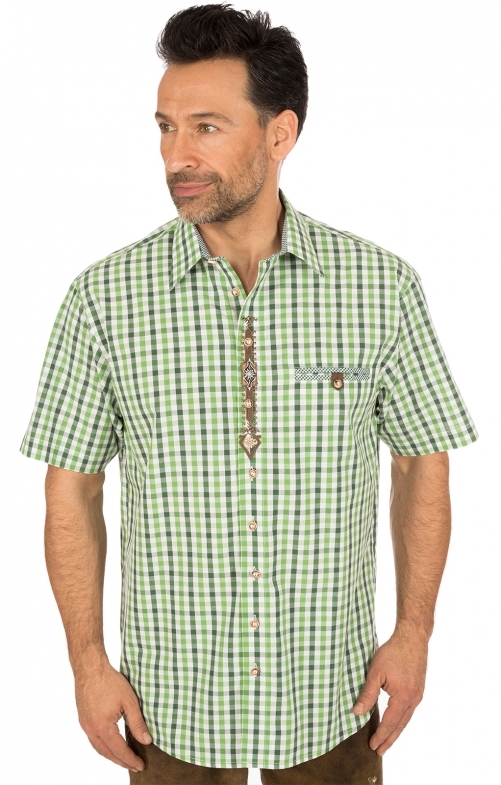 Particular attention is the embroidered and appliquéd button placket in front in brown wash leather whose embroidery is repeated a little smaller on the short sleeve. Check contrasting piping on the inner collar and on the beheaded breast pocket show the high quality of workmanship of this traditional shirt.